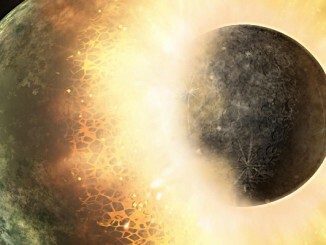 An artist’s impression of Earth during the first half billion years of its existence, showing how the planet was bombard in its extreme youth. Those impacts blasted debris into space, some of which likely made its way to the Moon. Image: Simone Marchi. Researchers have identified what may be the oldest known Earth rock, a fragment that may date back to the so-called Hadean era shortly after the planet’s formation. In a counterintuitive twist, the sample was found not on Earth but on the moon, brought back by the Apollo 14 crew in 1971. Chemical analysis suggests the rock was blasted into space after a large asteroid or comet smashed into Earth shortly after the birth of the solar system. The rock eventually ended up on the moon, which was three times closer than it is today, about four billion years ago. It then was mixed in with other surface materials, the researchers conclude. 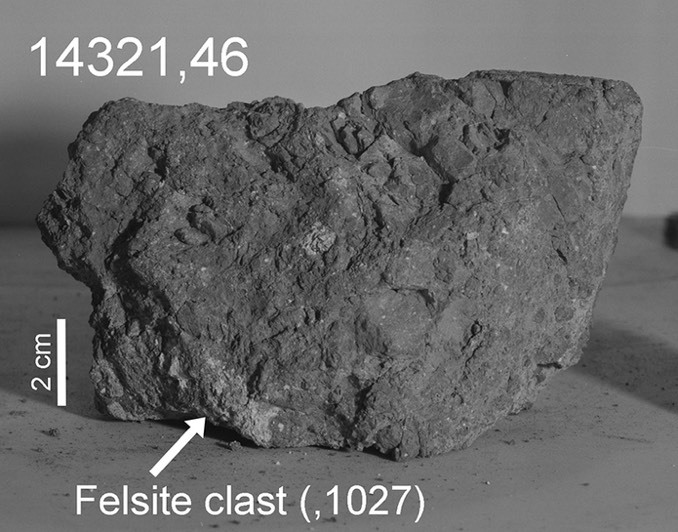 The sample was identified by Research Scientist Jeremy Bellucci and Professor Alexander Nemchin, working at the Swedish Museum of Natural History and Curtin University in Australia, using a new technique for locating fragments of impactors in the lunar regolith. They found a 2-gram fragment in the Apollo 14 samples that was composed of quartz, feldspar and zircon. While commonly found on Earth, the minerals are extremely unusual on the moon. Chemical analysis showed the rock likely crystallised in a terrestrial-type oxidising environment at terrestrial temperatures, not the more extreme conditions found on the moon during that same period. While it is still possible the fragment has a lunar origin, its formation would require conditions never before inferred for lunar samples, requiring the sample to have originated at extreme depths in the moon’s mantle where researchers say different rock compositions are suspected. The analysis indicates the fragment likely formed about 10 kilometres (12 miles) below Earth’s surface some 4 to 4.1 billion years ago. Impacting asteroids during that period were blasting out craters hundreds to thousands of kilometres in diameter, delivering more than enough energy to excavate materials from deep within the crust. Rocks that made it to the moon would have been subjected to additional processing, the researchers explain. The fragment in question was partially melted about 3.9 billion years ago as a result of one more lunar impacts. The final impact event occurred about 26 million years ago, the researchers say, excavating Cone Crater, a 240-metre-wide (1,115 feet) depression sampled by the Apollo 14 crew during the third lunar landing mission in 1971. David A. Kring, a Universities Space Research Association scientist at the Lunar and Planetary Institute, expects the conclusion to be controversial. But he suspects similar samples will be found in the Apollo rocks from other missions. 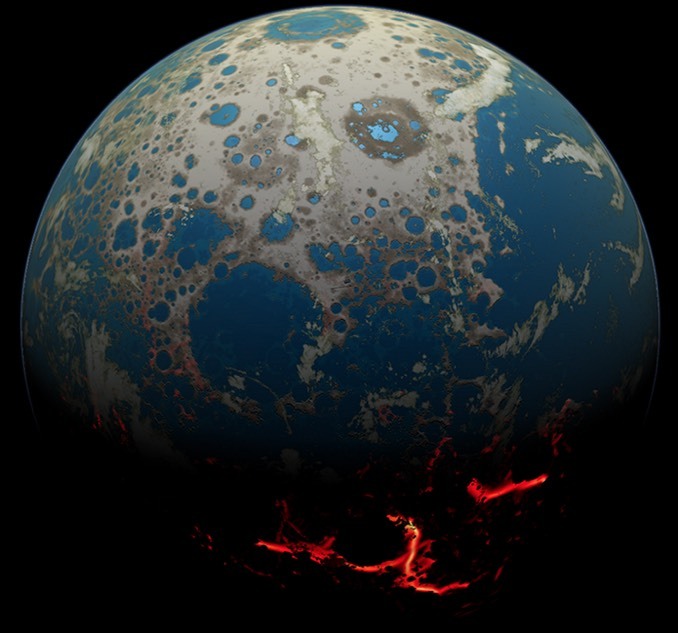 “It is an extraordinary find that helps paint a better picture of early Earth and the bombardment that modified our planet during the dawn of life,” he said in a news release. 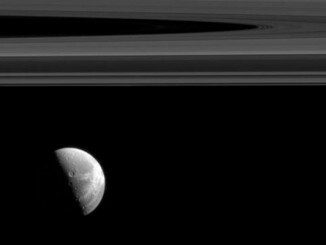 Dione’s beautiful wispy terrain is brightly lit alongside Saturn’s elegant rings in this image from the Cassini probe. 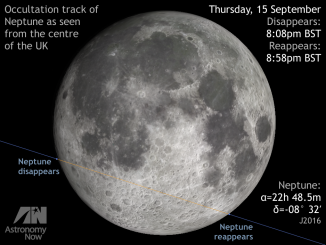 Observers up for an extreme observing challenge may care to make an attempt at viewing the almost full Moon pass in front of planet Neptune soon after 8pm BST on Thursday, 15 September. The planet’s disappearance occurs at a low altitude in twilight for the British Isles, but can also be seen from a large swathe of Europe and western Russia.